Despicable Me 3 in Movie Theatres June 30th & CONTEST! Despicable Me 3, In Theatres June 30th 2017! My kids are celebrating that Despicable Me 3 is releasing this summer, right after school lets out! It comes to movies theatres on June 30th, and we're not going to miss it. My husband and I also love Dru and the Minions, with actor Steve Carell once again voicing Dru in DM3. Carell has really made my family laugh out loud in previous Despicable Me installments, and we're winding up for another big laugh in part 3! The trailer looks good too (below), so we're pumped! Gru (Steve Carell) and his wife Lucy (Kristen Wiig) must stop former '80s child star Balthazar Bratt (Trey Parker) from taking over the world. 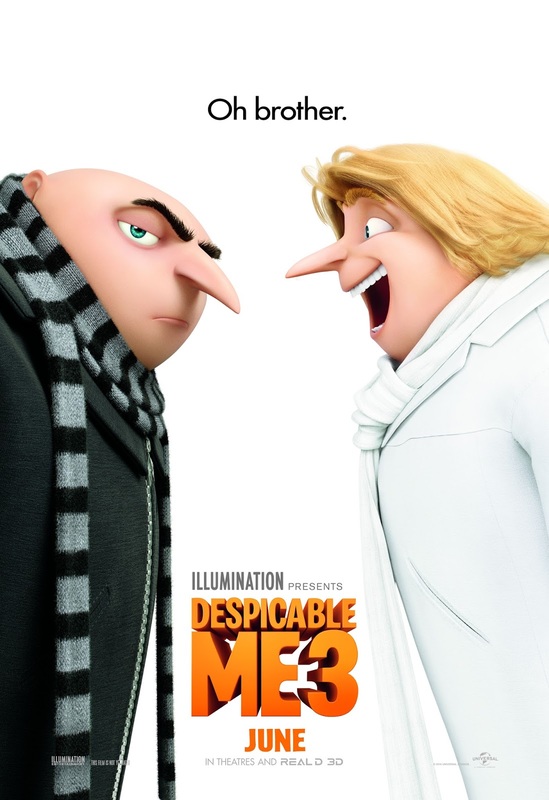 But sibling rivalry hits hard when Gru meets his long-lost charming, cheerful, and more successful twin brother Dru. And now Dru wants to team up with him for one last criminal heist to steal the diamond that Bratt has stolen. WIN family pack (good for 4 people) to see the Despicable Me 3 advance movie screening in Toronto on Wednesday June 28th, 2017 at 7:00pm. Contest ends on Friday June 16th, so do check your e-mails on that date to see if you're a winner. LEAVE A COMMENT BELOW stating why you want to see Despicable Me 3. Then use the entry form below to enter the contest. GOOD LUCK! This is the only movie franchise that my two kids will sit through. I want to see Despicable Me 3 because we are big fan of minions! They are funny! KY kids just watched the trailer over and over again this morning. I love the minions. I'd love to see this because I really liked the previous 2!!! One of my favourite films. We have seen both Despicable Me and Despicable Me 2 and I know we would enjoy see Despicable Me 3. We are big fans of these movies! Looks like it'll be a hilarious one and the kids will love it! This would be another awesome way to spend the evening with my nephews. And one of them is celebrating his birthday on the 29th, this would be a great pre-gift! Love the series of movies. My son is coming home after a year living in a treatment center. We loved the first two Despicable Me movies, and this prize would be a fantastic way to celebrate our family reunion. The first 2 where really funny so I would love to see Despicable Me 3. I think that it would be a great family movie night movie. My family would love to watch the Despicable Me 3, because we love the minions!! Despicable Me is my favorite animated series. Minions are the best! Love to see the interaction between Gru and Dru, should be hilarious. My niece and nephew are also super excited for the movie. Despicable Me is my favorite animated series. Minions are the best! Love to see interactions between Gru and Dru, should be hilarious. My niece and nephew are super excited for the movie. My daughter and I live despicable me. We love minions and would love to see the new movie. First two movies are so amazing! And I love minions! We love the minions! My girls could watch the Minion movies over and over and over.....they are on repeat in our house. I really want to take my two daughters to see this movie, because we all love minions!! Even their wallpapers are minion-themed! I would love to spend the last few days before school holidays with my children enjoying Gru and the minions. Loved the other two movies of the series. Despicable Me 3 should be even better! My kids would love to watch! !